No more than 2.8% of children are out of school in India, the first time the figure has fallen below 3%, bringing the total school enrollment to a record 97.2%, according to the Annual Status of Education Report (ASER), 2018. The proportion of girls out of school has also declined, from 6% in 2010 to 4% in 2018. The number of states where the figure is higher than 5% has dropped to four major states, compared to nine states eight years ago. 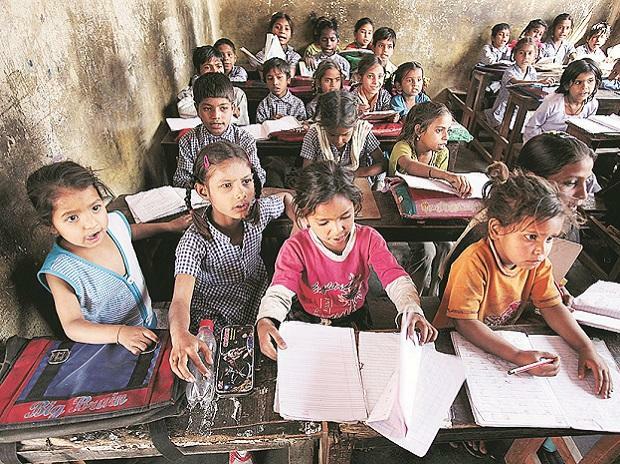 These achievements are attributed to the Right To Education Act 2009 (RTE) legislation, which mandated free and compulsory education for six- to 14-year-olds and is credited with reducing “inequalities in access between states” and “beefed up infrastructure in government schools”, the report said. Such improvements, however, mask latent issues in the country’s rural school network, where numeracy and literacy standards remain sub-par and in many instances lower than standards recorded 10 years ago in 2008. The ASER survey is a nationwide household survey, covering 596 districts in rural India. A total of 354,944 households and 546,527 children between ages three and 16 were surveyed to evaluate learning outcomes. After five years of schooling, at age 10-11 years, just over half (51%) of students in India can read a grade II level text (appropriate for seven- to eight-year-olds). This figure is lower than in 2008, when 56% of grade V students could read a grade II level text. The results for arithmetic ability show a similar picture: Just 28% of grade V students are able to do division, compared with 37% in 2008. Learning outcomes witnessed a decline following the “push towards univeralization” after the RTE came into force in 2010, the report noted. One explanation given is that the exercise to ensure every child was enrolled meant children that had dropped out, or were never enrolled in from the beginning were brought back in to schools and lowered average learning levels in government schools. But while there have been improvements across numeracy and literacy indicators since 2010, levels remain below those seen a decade ago and significant disparities in learning outcomes across the nation’s states persist. For example, while over three-quarters of students in grade V in Kerala can read a grade II text, significantly higher than the national average (51%), the proportion drops to no more than 34% in Jharkhand. Poor performance in school-based reading and math tests also signals future problems in adulthood, as the lack of foundational skills impedes children’s ability to carry out basic life tasks. Under a third of 14- to 16-year-olds (29.3%) were able to calculate the 10% discount applied to a T-shirt costing Rs 300. Just 27.9% of grade V children can solve a division problem, showing little improvement over a 10-year period. Meanwhile, no more than half of grade V children are able to read a text appropriate for grade II level students, down from 56.2% in 2008. While these attainment figures have been climbing since 2012, they remain low and suggest over 70% of grade V children have not yet attained the foundational maths skills children are expected to grasp after the first three years of education, meaning the majority of students are not ‘ready’ for the grade in which they have been placed. The national averages hide a fragmented state-wise picture, regarding how different states compare on literacy and numeracy indicators. Himachal Pradesh has the highest proportion of grade V students able to do division at 56.6%, 49.4 percentage points higher than Meghalaya, which had the lowest at 7.2%. The gap is similar for literacy levels: The best performing state in 2018, Kerala, records that 77.2% of its grade V students are able to read a grade II level text, compared to 34.3% of students in Jharkhand (a 42.9-percentage-point difference). Government schools showed a significant drop in the percentage of children passing ASER’s numeracy and literacy tests after 2010 (potentially for the reasons associated with RTE implementation mentioned earlier), but have started to show signs of improvement over recent years. In 2012, the proportion of grade V children in government schools that could read a grade II text had declined to 42% from 53% in 2008. In 2018, the figure has climbed back up to 44%, which is “indicative of a change of emphasis towards improved learning outcomes”, the report said. This is good news for the most disadvantaged in society--the group most likely to attend government-run schools, as ‘better-off parents’ choose to distinguish themselves by sending their children to available private schools in the area--according to the report. Several states now match or have surpassed 2008 literacy levels, where the proportion of children in grade V who can read a grade II level text is higher than before the RTE was implemented. These include Kerala, Punjab, Karnataka, Odisha, Tamil Nadu and Uttar Pradesh. However, the gap between learning levels at government and private schools is widening, the report said. In 2008, the percentage of grade V children able to read a grade II level text in government schools was 53%, compared to 68% of children in private schools--a 15-percentage-point gap, which has widened to 21 percentage points in 2018. Private school enrollment increased from 18.7% to 30.8% between 2006 and 2014, but has now plateaued, with 2018 enrollment levels showing little change from 2016. Up to 30.9% of children are enrolled in private schools in 2018, up from 30.6% in 2016. Indian classrooms are filled with students grouped together by age-group, rather than attainment, a situation which has not altered over the past ten years. For example, 12% of children in grade III could not even recognise letters of the alphabet, while 27% are able to read an entire grade II-level text. ‘Multi-grade’ classes, where children with varying levels of ability are mixed together, can leave struggling students behind, as teachers following the grade-level textbook reach only the top of the class, the report said. Improvements to the pupil-teacher ratio could help tackle varying abilities in classrooms, as more resources help reach a larger number of children and address specific learning challenges. The percentage of schools complying with the RTE-mandated pupil-teacher ratio--of 30:1 for primary schools and 35:1 for upper primary schools--has almost doubled since 2010, rising from 38.9% to 76.2% in 2018. However, the state-wise breakdown shows extreme disparities between states, with the proportion of schools complying with the pupil-teacher ratio in Bihar at no more than 19.7% (up from 8.8% in 2010) and Jharkhand at 28.3% (up from 11.2% in 2010), compared to 99% in Sikkim. The proportion of schools with usable girls’ toilets has doubled since 2010, the year the RTE Act mandated that separate facilities must be available for girls and boys, rising from 32.9% in 2010 to 66.4% eight years later. Further improvements have been seen in the proportion of schools with boundary walls, important for protecting child safety, rising from 51% in 2008 to 64.4% in 2018. Up to 91% of all schools now have a kitchen shed (up from 82.1% in 2010) and the proportion of schools with reading material other than textbooks up from 82.1% to 91% over the same period. However, as with educational attainment levels, the national averages hide widely-differing state-specific realities. For example, while 74.8% of schools nationally are recorded as having drinking water available on site, in Manipur (6.5%), Meghalaya (15.5%), Nagaland (27.3%) and Jammu & Kashmir (57.8%), the figures are significantly lower. Similarly, while states such as Gujarat, Himachal Pradesh and Punjab now have over 80% of schools with girls toilets available, many of the northeastern states like Tripura (32.7%), Mizoram (34.9%) and Meghalaya (47%) are languishing at under 50% in 2018. Having girls toilet facilities on-site and in a usable condition is an important way to help improve the retention rate of girl students, some of whom are at risk of dropping out if safe and hygienic facilities are not to hand. On average, a mid-day meal was found to be served in 87% of schools on the day ASER surveyors visited in 2018, a seemingly impressive outcome for a key government programme aimed at tackling the prevalence of malnutrition in children. Yet, the state-wise breakdown shows a more unequal picture. In several northeastern states, under 50% of schools served the mid-day meal, including Manipur (46.4%), Meghalaya (47.9%) and Nagaland (27.4%). In many states, the proportion of schools that served the mid-day meal on the day of the visit had decreased from 2010. For instance, in Uttarakhand, Madhya Pradesh and Haryana, over 90% were found to be serving the mid-day meal in 2010, whereas in 2018 the figures were 88%, 82.9% and 85.3%, respectively. Sports infrastructure in primary and upper primary schools was assessed for the first time as part of the ASER survey and revealed a shortage of physical education (PE) teachers across the country. PE teachers are available in no more than 5.8% of all primary schools and 30.8% of all upper primary schools, with just three states (Haryana, Rajasthan and Kerala) scoring better than the national average. Just over half of primary schools (55.8%) and almost three-quarters of upper primary schools (71.5%) have some kind of sports equipment. By grade VIII, at age 14, the percentage of children able to read a grade II text, suitable for seven- to eight-year-olds (73%) or who can do division (44%) remains far from 100% and showing little improvement over a 10-year period. This suggests over a quarter of children lack the basic reading skills, and over half lack the basic numeracy skills thought necessary in their last year of compulsory schooling. Their lack of of foundational math and literacy skills is further emphasised when applied to real-life scenarios such as calculating time or financial decision-making. No more than 47% of 14- to 16-year-olds were able to correctly answer a time-calculation question, while just 29.6% were able to figure out the price of a t-shirt after a 10% discount is applied, highlighting how many children are leaving school without the basic skills required in adult life. Girls performed worse than boys in each of these tasks: Up to 48.4% of girls aged 14-16 were able to correctly calculate how many purification tablets were required per litre of water (requiring children to apply the unitary method) or calculate discount, compared to 56.2% of boys.